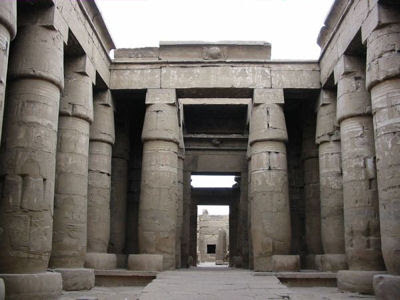 The Temple of Khonsu was started by Ramses III, and like his small temple in the Great Court, it is a classical New Kingdom temple. It was dedicated to the moon-god Khonsu, son of the Theban triad. The reliefs were completed by Ramses IV, Ramses XII and Hrihor, the high priest who usurped the throne at the end of the 20th Dynasty. The entrance pylon bears representations of Hrihor and his wife making sacrifices to the Theban deities. He stands in the position and posture traditionally assumed by the pharaohs of Egypt. 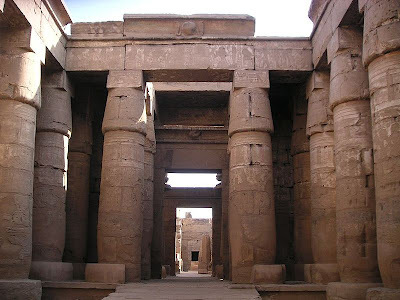 The temple is, therefore, of historical importance, bearing witness to the transmission of pharaonic power from the royal line to the priests of Amon, around 1080 BC. In this temple the name of a high priest appears in a royal cartouche for the first time. 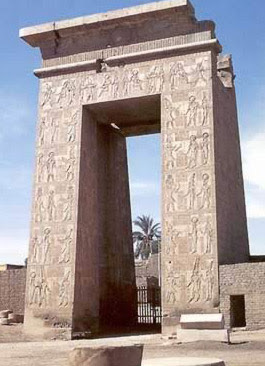 The ceremonial gate (southern gate) was built by Ptolemy III Euergetes (222 BC). Between it and Luxor Temple to the south were the palaces, villas, factories and markets of the inhabitants of ancient Thebes, now lost beneath the accumulated ruins of successive generations who have inhabited the same place. There was also a sphinx-lined avenue along which ceremonial processions travelled between the two temples.